Frank Buckles, the Last American Doughboy, died yesterday at his West Virginia home. With his passing, World War I becomes strictly a matter of history for Americans. It is no longer an event within "living memory." (Wikipedia says there are two confirmed World War I veterans yet living; both served in the British armed forces, though Claude Choules moved to Australia after the Great War and served under that nation's colors in World War II.) Oh, there are yet some who were alive during the War to End All Wars, but all living memory of going "Over There," the trenches, the mud, the rats, the gas, the thunder of the guns -- all of this is gone now. When I was a boy, there were lots of World War I veterans. They were the granddads. When Charles Schultz drew Snoopy as a World War I flying ace, there were a good many newspaper readers who had thrilled to the first accounts of the battles between those Knights of the Air. 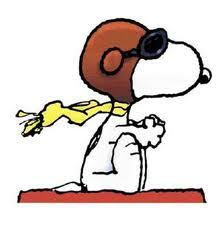 Some of the real air aces were still around to chuckle at Snoopy's misfortunes right along with the rest of us. The other night Youngest Son had computer issues: It crashed just after he'd completed a paper and would not restart. My wife volunteered me to get up and sit with him as he called across the world for assistance in bringing the machine back to life. It was the wee small hours of the morning, of course; that's when high school seniors tend to write papers that are due immediately after sunrise. Youngest Son was on hold forever and I flipped on the TV to stay awake. There was a silent comedy on TCM; it was about two doughboys who escape from a German prison camp. It occurred to me that Youngest Son wouldn't have seen German uniforms from World War I; come to think of it, I couldn't remember the last time I had seen any either -- certainly not outside of some program on the History Channel. World War I had once dominated the popular imagination. Then the horrors of World War II crowded World War I from the collective consciousness. And now World War I becomes a matter for historical study only. The veterans of the Second World War were the dads of my youth. They are dwindling fast now; the last of these will be go someday, too, like Mr. Buckles, honored and celebrated and revered as the last of his kind. The last World War II survivor will probably have been a kid who lied about his age to get into uniform, just like Mr. Buckles did. It will probably be that way for the last Korean War veteran, too, or the last veteran of Vietnam. All the debates over strategy and tactics are glossed over, simplified, or even forgotten, as the generals fade away. The historians decide who was right and who was wrong (and change their minds every generation or so). The last living memories of any war aren't the grand schemes of planners and staff officers, but the vivid impressions made on a teenager's mind, far from home and kin. Police and fire not among the most hazardous professions? Last October, I ran a serious post, Solve the budget crisis: End (most) public pensions. Like most of my serious posts, it landed with a dull and largely unheard thud in the Greater Blogosphere. To summarize, I suggested that (a) current public pensions be honored for people who have already earned them and (b) public pension contributions be stopped immediately for everyone else except police officers and fire fighters. Anyway, I suggested that its mostly people without pensions who are paying, by their taxes, the salaries and benefits of public sector employees. Why should public sector employees (who already have unions, civil service and Shakman protections) also have pensions their neighbors no longer have? My suggested exemption for police officers and fire fighters was based on the notion that these individuals put their lives on the line on every shift. Why make pension exemptions to police and fire? You mention risk, "putting their lives on the line" but these public union jobs [don't] even make the top ten hazardous occupations list. Besides, public safety pensions make up over 70% of municipal pension obligations, so if you're going to make a cut, it makes sense to start with the greatest abusers of pension entitlements, police and fire. You're the reason real pension reform [won't] occur when you whore out your preferences to fire fighters and such. [B]ecause, when you state that governments are bankrupt, [don't] have the money, but then go ahead and make exceptions, no one takes you seriously. My first thought was to reply that the most dangerous occupation must be this guy's food taster -- but it occurred to me that that would be just stooping to the commenter's level. If police officer and fire fighter are not among the 10 most hazardous occupations, what are the 10 most dangerous occupations? The last of these 10 most dangerous occupations, construction laborer, supposedly has a fatality rate of 18.3 per 100,000 workers. If I am reading this statistic correctly, on an annual basis, we can expect 18.3 deaths for every 100,000 persons engaged in the occupation of construction worker. This is the same death rate as expected for hazardous occupation no. 9, "Truckers and Drivers/Sales Workers." The death rate for Industrial Machinists is given at 18.5 per 100,000 persons. The death rate for Sanitation Workers is given at 25.2 per 100,000. This last one shocked me. I've heard of guys employed by Streets and San being found in automobile trunks from time to time, but these unsolved mysteries were never assumed to have been caused by picking up garbage. I have lived in Chicago a long time, and I've never heard of a line of duty death involving a worker on a garbage truck. But I have heard of Chicago police officers dying in the line of duty -- several this past year. So I inquired further and discovered this December 28, 2010 article by Patrik Jonsson on the Christian Science Monitor website. In the article, Jonsson writes that there were 160 deaths among American law enforcement officers in 2010. He adds that there are "about 800,000 active local, state, and federal law-enforcement officers in the US." Doing the math, I come up with a fatality rate for police officers in 2010 of 20 per 100,000 -- above three of the 10 allegedly most dangerous occupations. But still below "Sanitation Workers." I could not find comparable figures for firefighter line of duty deaths. The United States Fire Administration, a division of FEMA, reported "there were 85 onduty firefighter fatalities in the United States as a result of incidents that occurred in 2010, a 6 percent decrease from the 90 fatalities reported for 2009. The 85 fatalities were spread across 31 states. Illinois experienced the highest number of fatalities (9)." There were 90 firefighter fatalities in 2009. But that doesn't give me a total number of firefighters or even define the term. However, it apparently includes professional urban departments, like the Chicago Fire Department, as well as rural volunteer companies and even smoke jumpers -- the guys who jump in the middle of forest fires. Therein lies the problem with these statistics. I can't believe that police officers or firefighters have a lesser risk of on-the-job fatality than the guy who picks up the trash. My experience tells me it ain't so. Some inside-the-numbers and inside-the-definitions exploration is clearly warranted in order to figure this out -- but this is, of course, impossible from the linked articles alone. And then there was the contention raised by my anonymous friend that "public safety pensions make up over 70% of municipal pension obligations." Sadly, he did not provide a source for that claim either. While police and fire make up a sizable chunk of any city budget, I wonder if 70% isn't high. I would guess that the number can't take into account teacher pensions (in Illinois these are paid from a different fund and school boards are separate taxing entities). But I just don't know. To use my new friend's colorful phrase, I wanted to 'whore around' some more and investigate this claim, but I flat ran out of time today. Perhaps I can come back to the topic again. Or someone may provide some additional facts in a comment? Rep. Wu's is apparently a sad story of mental decline (for background, read this) and I don't mean to pile on. Still, I couldn't help but think that Mr. Wu's increasingly well-documented problems weren't entirely new. There was something about him that triggered my increasingly feeble memory. Then, today, I remembered this March 2007 post about a Finnish parliamentarian who had gone to the trouble of translating his campaign web site into Klingon. Yep. 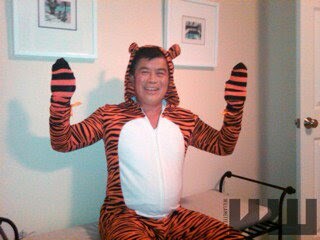 That's Rep. David Wu. Now, whether I agree or disagree with the point Congressman Wu was trying to make is immaterial. His little speech here makes reference to both Vulcans and Klingons. That's weird... but not really crazy. The crazy part is that his argument can be understood only by old geeks like me who've watched Star Trek lo these many decades. I kind of doubt there's that many of us... are there? But however healthy things seem at the top of the economy (thanks all too often to the massive and timely infusions of taxpayer money), for the rest of us, those deemed small enough to fail, things don't seem to be getting better at all. I had a client declare bankruptcy recently. If I did bankruptcy work, that might be a good thing for me... but I don't. What that client owes me won't drive me into bankruptcy by itself... but I am teetering on the brink, too. Somebody asked me recently whether my business is trending up or down. "I think it's more a swirling motion," I responded. The February rent is not yet paid. March starts next week. Although Illinois may have found one silver lining in all this: We had Democratic members of the Wisconsin State Senate hiding out in Rockford and Harvard and even Chicago, trying to prevent a vote on measures proposed by Wisconsin's Republican Governor, Scott Walker, that would require public sector employees to contribute more to their own health care and pension costs, limit their right to strike, limit their union's rights to bargain to wages only and not working conditions, and limit the extent of raises that may be granted. Meanwhile, Democratic legislators fleeing Indianapolis (where a right to work vote was set for the Indiana legislature) took refuge in places like downstate Champaign. It was not quite four years ago that I asked here about whether I should switch to compact fluorescent light bulbs at the Curmudgeon home. Well, I did switch. 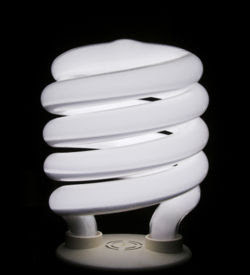 As incandescent bulbs failed, they were replaced by CFL's. I still have a few left, but they're in fixtures that don't seem to support CFL's -- and there are few of these -- the light over the kitchen sink and a decorative bathroom fixture are the only ones that come to mind right now. I'm wondering how long I have before I have to replace those fixtures. You don't see incandescent bulbs on the store shelves much anymore, do you? I sit under harsh fluorescent lights here in the Undisclosed Location. My desk lamp, which used to provide a warm, comforting incandescent glow in the midst of the cold fluorescent harshness, has long since been replaced by a CFL, too. Granted, I'm four years older, since I began switching to CFL's, and eyestrain should become an increasing issue over time. But an association is forming, in my imagination at least, between incandescent light and my eyes not hurting so much. So I put the issue to all and sundry who might happen upon this post: Have you noticed any increased eyestrain since switching to fluorescent lighting at home and away? Is there scientific evidence that backs up or refutes the association that I've made between increased eyestrain and constant fluorescent lighting? Have you ever had a snake-bit case? I realize that most of the people who might happen upon this blog aren't lawyers, so that's probably a dumb question. But have you ever had a task, a project, an assignment where absolutely nothing is done right the first time? I have a matter now pending in the Appellate Court that fits this description. The very pendency of this matter in the Appellate Court is a dead giveaway. But a case doesn't become snake-bit just because a judge makes a decision that I disagree with. Yesterday I had a motion to file in the Appellate Court. In this case, of course. It was a housekeeping motion, about something that should never have had to be done in the first place, but that's been the nature of this beast. The Appellate Court is close by my Undisclosed Location and yesterday felt like the first day of Spring. The Groundhog's Day Blizzard is shriveling away. Of course, the first day of Spring in Chicago does not involve a lot of green. The predominant covers are brown or black as the dirt and pollution and the mud remain behind as the once-pristine white snow melts to an ugly gray. Anyway, yesterday's motion was for leave to file something. I had the something on my desk. I prepared the motion without incident. I got through Security at the Appellate Court and started pulling my keys and my phone out of the folder in which I'd brought over the motion and that is when I noticed -- the something to be filed, the subject of the motion, was still sitting on my desk, wondering where I'd gone. Oh, fiddlesticks! I might have said, but did not. Of course, a phone call I'd been waiting for came in while I was on this fool's errand. I returned the call -- and while I was chatting away, I thought to make the envelopes to send out the copies of the motion. This was accomplished without incident. I thought to put the thing to be filed into my folder. And then I thought to put the stamps on the envelopes. So I took the motions out for just a moment so I could weigh one with the envelope and apply the proper postage. I got through Security again and fished out my keys and my phone from the folder and I smiled when I noticed that the thing to be filed was in the folder just where I'd put it -- and my smile faded just as quickly that the motion was no longer there. Oh tarnation! I might have said, but didn't. Now, the third time was the charm. I got the motion and the thing to be filed over to the court clerk at the same time. Now, if this happened to me in every case, you'd say (and I'd agree) that I need a keeper. But it only happens in cases like this one. Cases that are well and truly snake-bit. I wrote a few years back about how I broke down and got my first pair of blue jeans in at least 20 years. I realize that no one has been checking in each day in breathless expectation of an update, but the topic is on my mind. Add blue jeans to the list of things that aren't as good as they used to be. When I was a kid, blue jeans were blue. Dark blue. Navy blue. And they were stiff. Oh, they could be folded. One could, with some effort, stand or sit while wearing new blue jeans. But it was a workout. Everyone at school knew when you had new blue jeans. It was not, as I seem to recall, entirely favorable notice. Of course, when you're an adolescent, unless you've just scored the winning basket at the big basketball game, almost any notice is unwelcome, at least initially. Coming to school in a new pair of blue jeans was nothing like winning the big game. Everyone else, in their more faded, softer blue jeans was far more comfortable. There was an element of risk the first time a new pair of blue jeans were washed, too. My mother always wanted them soaked in a vinegar solution to hold the color. That was just like parents: Darker jeans were definitely less cool than faded jeans; therefore parents instinctively favored darker jeans. Whether vinegar was used or not, however, anything washed with the new blue jeans was apt to turn at least a robin's egg blue. Faded blue jeans were celebrated in songs during the 1960s for a reason: By the time a pair of blue jeans were properly faded, they'd been lived in. Your favorite blue jeans were privy to your habits, good and bad, and even your secrets, if you had any. When the knees went, applying a patch was much more than garment repair; it was first aid for a friend. It turns out that relaxed fit doesn't just mean that six of your high school selves could occupy those pants. And it turns out that "stone washed" is literally true. On one of those "How Its Made" programs aired on the Science Channel I learned that new blue jeans are pre-washed in what amounts to giant washing machines. Instead of fabric softener sheets, actual stones -- small boulders, even -- are washed with the jeans to 'break them in' before they're foisted on a lazy public. Either the modern jeans consumer is too sensitive about the reaction obtained when wearing new jeans or too lazy to break them in as we did in the 1960s and 70s. Blue jeans fade now after being laundered only a few times -- and why not? They've already gone through extraordinary wear (and even tear) before getting put on the shelves. And every parent knows that pre-torn jeans are more expensive. When a patch is required, as it will be all too soon on the modern blue jean, the item is not an old friend; it's hardly even a casual acquaintance. One of my all time favorite entertainers, Benjamin Kubelsky, was born right here in Chicago on this day in 1894. You may remember him as Jack Benny, the Pride of Waukegan. I was reading Fred Allen's Treadmill to Oblivion again recently. Toward the end of the book he pays a wonderful tribute to his supposed enemy: "He is my favorite comedian and I hope to be his friend until he's forty. That will be forever." And speaking of people who don't yet admit to 40, here's a birthday shoutout to Skeezix Wallet. He looks pretty good for 90, don't you think? And there is yet one more birthday shoutout to make this morning, this one to my Older Daughter. She doesn't read, or even know about, this blog. If she saw this, she'd be upset by my continued association of her birthday with Jack Benny's. I'm upset by the fact that she's 27 today. Twenty seven? How is anyone supposed to believe I'm still 23? Even when I explain how it works according to the New Math I learned in the 60s? I may have to move my admitted age up to 39 as well. What does Yahoo! 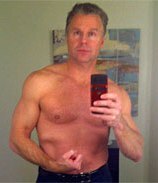 think I am -- a Republican congressman? I have a couple of different Yahoo! mail accounts; there's one linked to the Sidebar on this blog. All of them recently developed the same problem. You may not believe this, but I don't know anyone named "Wett.heartz590." I certainly did not ask Mr. or Ms. Heartz (you will note the indistinct gender identification in the solicitation) to add me to his or her contacts list. The same goes for Mr. or Ms. "Warm.potion" something-or-other that also popped up. And, frankly, I'm kind of ticked off about the fact that Yahoo! is letting this kind of stuff through. I mean, who do they think I am? Former Republican Congressman Chris Lee? First of all, the last time I appeared in public without a shirt, Captain Ahab tried to harpoon me. Anyway, this has happened now 12 or 15 times and I was moved this morning to try and write to Yahoo! to complain. I clicked around for some time, finding menu upon menu of 'frequently asked questions' but nothing about these unwanted messenger pop-ups. Apparently not too many are asking about Mr. or Ms. Heartz or Potion yet. Or maybe Yahoo! customers are flattered by the solicitations and accept the invitations. Personally, I think these solicitations are invitations to contract a virus -- computer or otherwise. I'm still trying to figure out how any question becomes "frequently asked" because I could find no address where I could ask anything at all. Anyway, I'm putting my complaint out here in the Greater Blogosphere in the hopes that some Yahoo! spider will see its exclamation points bandied about in this fashion and put an end to the unwelcome solicitations of Mr. or Ms. Heartz and Potion. Or, possibly, introduce them. I run photos here at Second Effort, some of which I've actually taken myself. Most of them, of course, are 'lifted' from other corners of the Internet. It took awhile to figure out how to insert a picture. Checking this morning, I think the first illustrations I put in this blog came in August 2006 -- nine months after I'd started this blog. And this was my second blog (hence the name). At home, I'm the guy who downloads photos my wife takes and stores them in various subfolders of the "My Pictures" directory. I can do minimal editing and everything! Anyway, having demonstrated so much ability in the capture and manipulation of images, you might think that a simple request for a photo would not throw the old Curmudgeon into a tizzy. You might think that -- but if it were so, this would be even a more boring post than it has been so far. I'm filling out a questionnaire for one of the bar associations that is reviewing my latest judicial application. Some of the questions are easy: No, I don't use recreational drugs. Yes, my license is current. No, I haven't been sued. Yet. But this questionnaire requests that I provide a photo. Of myself. Most of the pictures I've been in lately are group shots: Older Daughter's wedding, Oldest Son's wedding. Events associated therewith. And even in these pictures there is a problem. Some techno-sharpie is Photoshopping me out of all of these photos and substituting some overweight, balding old man where I should be. I have been vigilant. I have paid careful attention. I still can't figure out how it's been done. And even if someone else weren't standing in the group where I should be, I doubt that a group shot is what the bar association has in mind. And even if I had a picture to provide... well, when's the last time you went to the drugstore to pick up prints? Everything's digital now... and nothing ever gets printed except for the stuff my wife frames. Despite my vehement protests, my wife has even had group shots framed that include that overweight, balding old man where I should be. But I need a picture and I need it now. So -- I thought -- I'll pull a profile picture off Facebook. There's a picture there that I've used as a profile picture that was taken at another family wedding this summer. The guy in this picture is also balding and overweight... but it's taken at such an angle, and in such dim lighting conditions, that these conditions are hardly noticeable. Facebook is interesting. I can lift anyone's picture that I have access to, apparently, except my own. At least that's what I discovered this morning. So, I fell back on a head-shot that was taken for me by a professional photographer some, um, seven years ago. My wife and I were coordinating a photo directory for our parish's 100th anniversary. One of us had to be with the photographer pretty much all the time when the parish families trooped in for their portrait appointments. It was during a lull following our own family portrait that I asked for the head-shot. "What do you intend to use it for?" the photographer asked. "For my business publicity," I told him, truthfully. That photo used to run with the column I wrote for the local legal newspaper. But neither the photographer nor I imagined, at the time, that I'd still be using it seven years later. I printed a copy on plain paper on my inkjet this morning and it didn't smear too much. In fact, the smears probably improved the image. And, no, I won't be running that photo with this post. I was wondering whether author of the strip, Zach Weiner, may have worked in his own lawyer joke into the cartoon. The student, Euathlus, turns out to be "a genus of the family Theraphosidae containing four species of tarantulas." However, if you check out the Wikipedia article on the Paradox of the Court, you will find that the student of Protagoras is called both Eulathus and Euathlus. This may mean that Wikipedia is in on the joke. It certainly means that the Wikipedia article is in need of proofreading. Everyone in Chicago seems to have been thrown a tad off kilter by last week's blizzard. Youngest Son has a whole mess of tests this week (this week's and last week's) and Long Suffering Spouse reports she's giving a bunch of tests starting today. "The good news," she said, "is that I had them ready to go before the blizzard." Courts were closed here last week. The Federal courts were closed last Wednesday; the Circuit Court of Cook County was closed Wednesday and Thursday. I can't remember that ever happening. It may have been a good thing, though. I saw that the chief judge of the courts in Dallas insisted they'd hold court despite a snow and ice storm (that greatly complicated matters for that scrimmage they played Sunday in the Jerry Jones Dome) -- and then broke his leg, falling on ice on the way to court. I had an appellate brief to write. It's due today. It will be filed today. So I took stuff home Tuesday night, hoping that I'd be able to work on it Wednesday. Two feet of snow later, I actually got to the brief on Thursday. Afternoon. Instead of writing the story I wanted to write this morning, I think I'll actually read the brief I wrote... just to be sure. And another unanticipated crisis landed on my desk last night. Yes, admittedly, I grumble a lot about all levels of government. If you paid your own withholding, like I do, you'd be wary of government too. But if government is evil, it can protect us from other, greater evils, and that leads us directly to into this morning's discussion. The evil in question is not the Red Chinese. The Chinese may be our rivals in trade, our most likely adversary in war, and the nation likely to supplant the United States as the world's hegemon as we gracefully decline into a really big Portugal, but they also own the biggest portion of our national debt. So, I don't mean to bite the hand that props us up. No, I refer to a menace far worse than the Chinese. I refer to the Telephone Company. I have complained about telephone service in other posts on this blog. Early on, I griped about troubles with the "Texans", a reference to the Baby Bell that later grew up to swallow its corporate progenitor. For the classically trained, you can critique my interpretation of Greek mythology at the post linked in this sentence. In that post, I called the telephone monopoly BP&P; in this 2009 post, I referred to the Telephone Company as AT&TT. Whatever it may be called, my latest dust-up with the Telephone Company came when I fell behind on my bill. I know I may be shattering some of your dearly held illusions about the great wealth of lawyers and I'm sorry that I haven't been able to live up to the standard, but when people don't pay me I find it well-nigh impossible to pay my bills. I let the office telephone bill go for one month, then two, waiting for the dreaded Red Notice all the while trying to plug up other, larger holes in the dike. The dreaded Red Notice came shortly after the regular bill arrived showing that my business account was two months in arrears. But here was the problem: The amount demanded on the regular bill was some $36 or $38 less than the amount demanded on the Red Notice. No, I didn't let things deteriorate to actual disconnection -- so I didn't actually incur a restoration charge. The two bills just demanded different amounts. Guess which amount I eventually paid? But the Telephone Company, having decided it was owed more, kept showing this phantom $36 or $38 charge on subsequent bills. On receipt of each bill, for two consecutive months, I wrote to the Telephone Company at the address designated on the bill for the sending of complaints. I asked for an explanation about this phantom charge. Where had it come from? I explained how I'd paid the amounts demanded on the bills. I imagine a giant shredder must be at that location: Letters complaining about this or that are apparently fed, unopened, into the maw of this giant machine. At least this would explain the total lack of response that I received from the Telephone Company to my inquiries. In month three, therefore, I decided to try a different course. I did a little research and ascertained that telephone service in this state is regulated by the Illinois Commerce Commission. I did a little more Googling around the web and found a site maintained by the aforementioned Illinois Commerce Commission on which I could tell the Sovereign State of Illinois all about my trials and tribulations with the Telephone Company. It was a fill-in-the-blanks type form. I filled in the blanks. I pressed enter. By the next morning -- the next morning! -- I had two voice mail messages from different corporate units of the Telephone Company both promising that a thorough investigation was underway and that I could rest assured that every effort would be made to resolve my problem. Several more calls followed. This would be a better story if I didn't have to pay the $36 or $38 -- but, alas, this proved not to be the case. It turns out that, several months ago, the Telephone Company mysteriously applied a credit of roughly that size to my bill, lowering my monthly payment for one whole month. I thought nothing of it at the time -- credits like this pop up every so often as the Telephone Company is forced to settle a class action suit or is otherwise caught overcharging its customers. This time, however, the Telephone Company insisted that the credit was applied erroneously. The error was not picked up until the dreaded Red Notice was put together. How could I argue otherwise? So I paid the #$@%! charge. Late last week, I received a letter from the Illinois Commerce Commission advising me that the Telephone Company had advised it that my problem was solved and inquiring if I thought so too. My thank you letter went in the mail last night. Not all government regulation is bad. Sometimes it is necessary to keep evil corporations more or less honest.